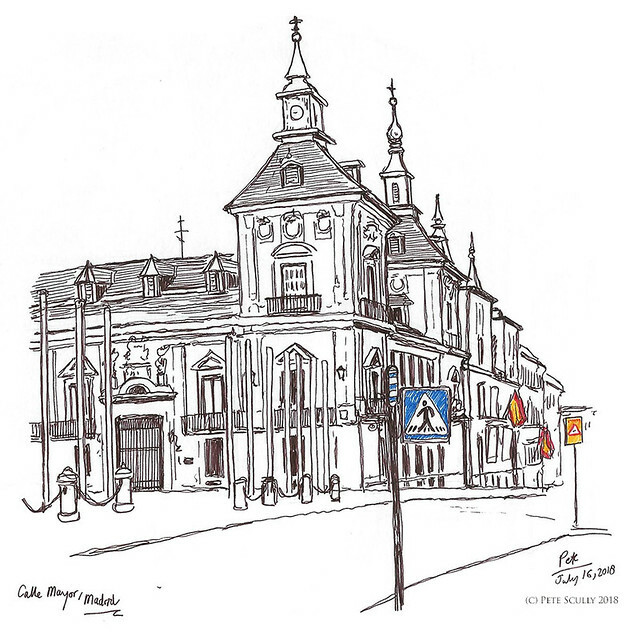 When travelling, especially with the family, I like to get up very early and go out sketching when there are fewer people about, when the light is fresh, and when I can bring back pastries for breakfast when I am done. I got this amazing chocolate covered doughnut pastry thing from a place called La Rollerie off of Calle Mayor one morning, wow that was good. Much nicer than a regular chocolate doughnut. Our apartment was located not far from the famous Plaza Mayor. 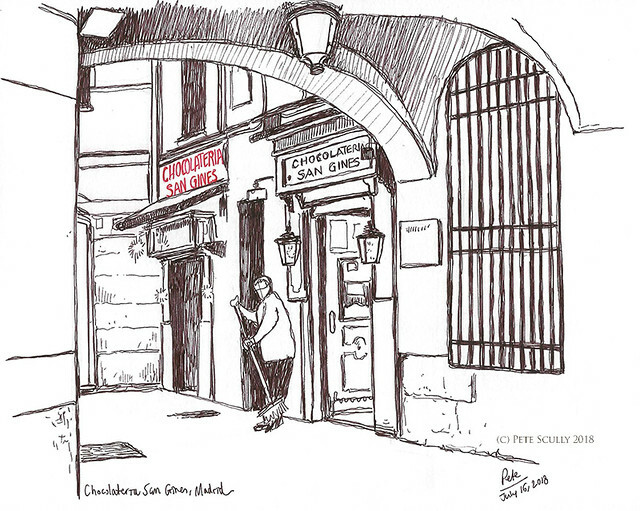 One morning I woke up and went over there to sketch the view down the Calle de Toledo I believe it is called, to the Parroquia Nuestra Senora Buen Consejo. I liked how it was framed through the archway from Plaza Mayor. Later in the day this archway would be filled with tourists and with painters selling their paintings of this very scene. As it is, it was peaceful, and I had no interruptions. Across the street from our apartment is the beloved Chocolateria San Gines. This classic Madrid establishment is the place to go fro churros and chocolate in the morning, or the afternoon, or the very late evening / very early morning, a bit like Bar Italia. At this time of day, around 6:30am, nothing else was open. The part which sells things other than churros and chocolate (and coffee and tea) was not open either, so no bringing pastries back today. We all just went over there for breakfast and sat downstairs, in the subterranean chamber decked out somewhat like a train carriage. And those churros were pretty delicious. Here beneath the archway leading to the chocolateria, one of the cafe workers cleans the street in front. The sun was barely up. I walked a bit further down Calle Mayor. I feel like I didn’t really explore as far in early morning Madrid as I did in Rome and Venice last year. I must not have looked at the map, because if I had walked a bit further down I could have drawn that big cathedral I missed sketching. 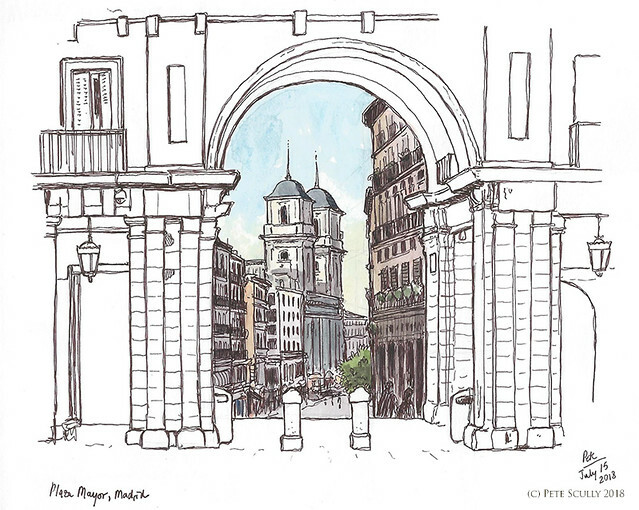 As it is, I stood here on the street and drew the Plaza de la Villa, which cut a beautiful shape against the morning sky. It looked even nicer the evening before, with the sun setting making the sky golden and purple. As I sketched, a cafe started to open next to me, and the streets started to get a little busier, as people went to work. 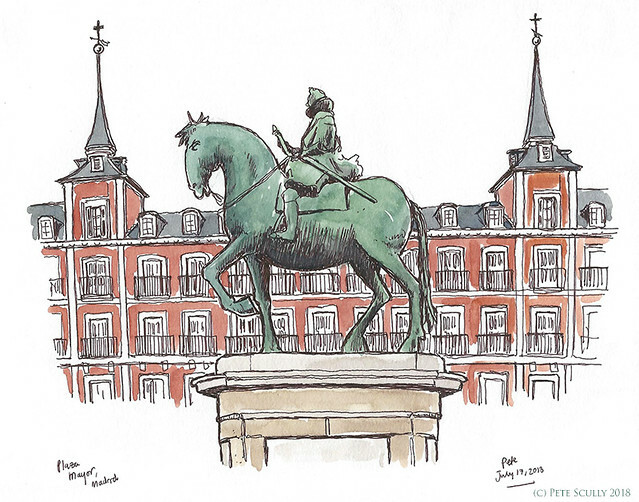 On our last morning in Madrid I got up early again and sketched the statue of King Philip (Felipe) III. He was the grandson of Charles V, after whom one of my favourite Belgian beers is named (Charles Quint). Plaza Mayor was laid out during his reign, some time between 15801 and 1619, and serves as one of the central squares of Madrid, as well as providing a nice touristy spot for those men selling those colourful light things that they throw into the air, or people dressed as human statues, which is something I am not a fan of. There are quite a lot of homeless people sleeping around the square as well, as we saw when we passed a man lying down asleep with his bare bottom sticking out on the way home one evening. Also on the square is a bullfighting bar, a restaurant that seems to be dedicated to displaying that most Spanish of pastimes. Again, something I’m not a fan of, but I know, it’s a cultural thing. I popped in to see the heads of bulls on the wall, not exactly a shocking sight. No, what shocked me were the photos of bullfights, not so much the bulls being murdered, rather the bullfighters – extremely graphic photos of horns going through throats and groins and all sorts of nastiness. It was like Deadpool v Logan with added South Park, but real. Yeah, not a fan of that. I sketched Plaza Mayor in the morning everything was closed, hardly anybody was walking about, except for a few people still enjoying their night-before. I passed by a young couple, who had clearly been out all night enjoying each others company in a Before Sunrise summertime story, the girl was getting into a taxi and saying to the boy, who was not, ‘Thank you for the great memories!’ before driving away, leaving him to walk giddily back to wherever he was walking back to. We’ve all been there, eh. They’ll write, they’ll ‘Friend’ each other, they’ll ‘Like’ each other’s Instagrams, eventually they will ‘Like’ when they see the other has a new boy- or girlfriend, though they will not really like it, then they will stop Liking, and then years later one will Message the other out of the blue saying hey remember that night walking around in Madrid until the sun came up? And the other will be like, oh yeah, I remember that haha, vaguely, whatever, who are you again? I’m reading a lot into this brief meeting I observed, as if I am someone who actually observes and understands human behaviour (we all know I’m not), for all I know they were at an early morning conference for people who sell USB memory sticks, like really good ones, and she was just saying to him, who is a marketer for the most advanced memory sticks and SD cards in the world, thanks for the great memories. Or maybe it was just after a psychotherapy session in which they had unlocked some really great memories from childhood they had forgot, I don’t know, jeez. 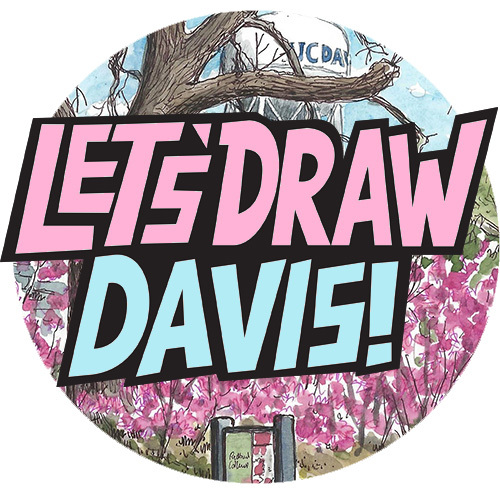 Look this is why I draw buildings. Much more uncomplicated.